Looking for a digital copy of inside magazine? 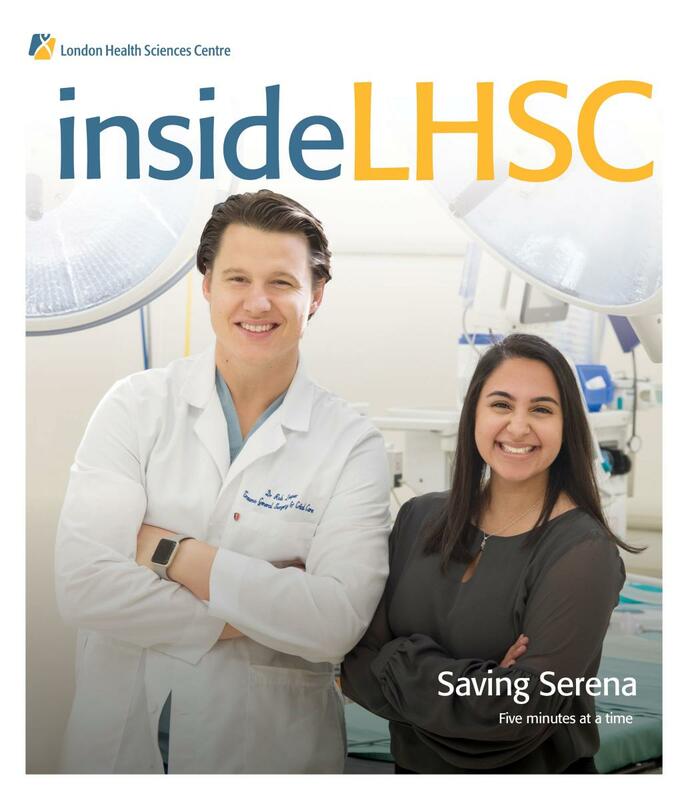 Download the pdf copy of the Spring 2019 edition of inside LHSC. Serena Tejpar is lucky to be alive. The injuries she suffered from a horrific car crash were catastrophic. The trauma team manually pumped air into her lungs five minutes per person for five hours before she was stable. Clark Burton is a hockey-loving four-year-old, but when his symptoms are flaring, even walking becomes a challenge. Thanks to a pair of bone conduction hearing implant, Laura Sitlington can now hear the conversations around her. This treatment option for patients with certain hearing impairments simulates the natural hearing process. The Core Laboratory at LHSC is one of the hospital’s busiest areas, performing roughly seven million tests citywide each year. When systems and equipment needed renewal, the team saw a natural opportunity to create a lab for tomorrow. Cancer that spreads from an original tumour to other parts of the body is usually considered incurable. In an international study led by Lawson Health Research Institute, researchers challenged this idea by showing high-dose radiation can improve survival in patients with cancer that has spread to five or less sites. LHSC has undertaken a volunteer-based walking initiative for patients who can walk independently. Being immobile for any length of time is especially impactful on older adults who can lose muscle strength, balance and agility at a quicker rate than those who are younger. London Health Sciences Centre promotes and supports a smoke-free environment and therefore smoking of any kind - including cannabis - on LHSC owned or operated premises, facilities, and grounds is not allowed.